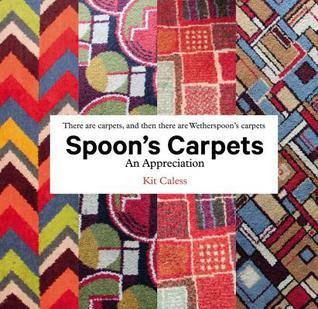 “It’s tough to write drunk, you know; this Spoons book is a testament to that.”Spoon’s Carpets, by Kit Caless, is beautifully presented, neatly sized, and full of subversive nonsense that is somehow glorious. Having read it cover to cover, dipped into it every time someone I know mentions visiting a Wetherspoons to see if the establishment warrants a mention, and flicked through the pages of photographs in wonderment that pictures of pub flooring can be so alluring, I am still unsure whether to categorise the narrative that accompanies each carpet included as fiction or non fiction. This work is destined to become an essential reference for Spoon’s aficionados. Really, you want this book.The author partook of a nationwide pub crawl to see for himself his favourite carpets in situ. Drinkers up and down the country had been sending him pictures after their boozy nights out. I guess some may consider this an improvement on other types of pictures sometimes sent. Several of the regular Spoon’s carpet photographers (yes, these people exist) are rewarded for their efforts by having their feet included. One such drinker is quoted as saying:“essentially everything is fantastical if you stare at it long enough”I ponder the level of inebriation required in order to fully appreciate the floor art depicted.Spoon’s regulars are described as high quality storytellers, which perhaps explains the factoids and local knowledge shared from each location. Other nuggets I mulled whilst absorbing the glory that is a Spoon’s carpet were: How can a town have more than one twin? Does The Regal, Cambridge need a new vacuum cleaner? How many pairs of shoes does the author own? As is pointed out, the carpets pose more questions than they answer.Statistics are also provided for the reader’s edification, from famous regulars (a statistic?) to improbable quantities of items consumed. For no particular reason, my favourite was: “Number of men who are an island: 0”And I guess that there is no particular reason for buying a book about pub carpets except that it is a surprisingly satisfying little item to peruse. As well as being educated in how a Spoon’s carpet is designed and manufactured, readers may use this as a travel guide. As tourist attractions go there are tempting possibilities, including the curry and beer. The appreciation of art has always been subjective, supposed experts regarded as a bit snobby. Appreciation of Spoon’s carpets, and the varied settings in which they lie, could buck this trend.My only complaint is that my local Spoons is not included in the selection. I need to know why it did not make the cut. I shall go buy a beverage and check out what they have to offer beneath my feet. Perhaps I will even take a picture.My copy of this book was provided gratis by the publisher, Square Peg.